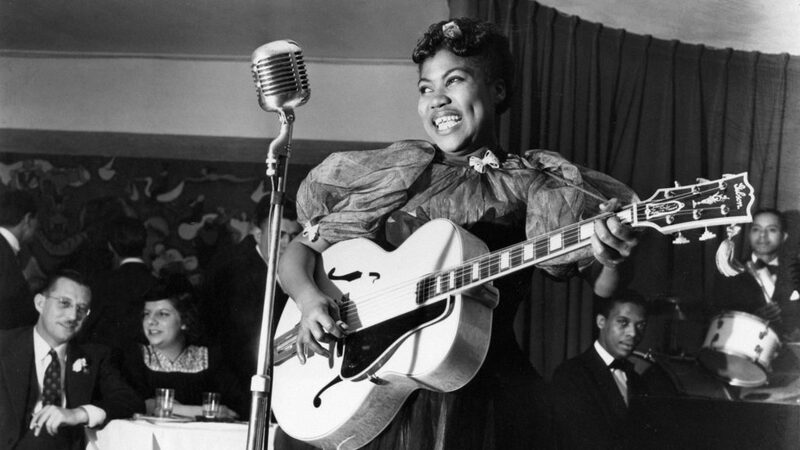 Happy Birthday to Sister Rosetta Tharpe (1915-1973). The holy rolling, guitar swinging, hymn singer who arguably gave birth to rock ‘n’ roll was buried in an unmarked grave for more than 35 years. Today, the high-octane godmother of rock is finally getting the recognition and respect she deserves. For fans of Sister Rosetta – my rockabilly buddies exposed me to her back in the mid-1980s – the posthumous crown and throne of adulation is bittersweet. She will finally be inducted into the Rock and Roll Hall of Fame on April 14. Her innovative guitar playing – finger picking solos and windmill strumming – was pioneering. Her fans included Elvis, Johnny Cash, Chuck Berry, Jerry Lee Lewis, and Bob Dylan. In 1942, Billboard Magazine called her music “rock-and-roll spiritual singing” – a decade before the phrase was commonplace. Today, her tombstone properly declares: “She would sing until you cried and then she would sing until you danced for joy. She helped to keep the church alive and the saints rejoicing.” Happy Birthday, Sister Rosetta! Thanks for bring the sound.